A German crisis team is working to win the release of two German hostages held in Iraq, after a second video showing them in distress appeared on a website.But the government has rejected the kidnappers’ demand that Germany pull its troops out of Afghanistan. Terrorism experts quoted by German media say the latest video, lasting five-and-a-half minutes, was probably recorded between 20 and 25 March. It shows Hannelore Krause, 61, and her son Sinan, 20. The video, bearing the signature of the “Siham al-Haq (Arrows of Righteousness) Brigades”, appeared on an Islamist website on Tuesday. The group had claimed to have seized the pair in a similar video issued on 10 March. German Foreign Minister Frank-Walter Steinmeier called the latest video “shocking and inhumane”. Mrs Krause was crying as she begged the German authorities to help them. “I urge the German people to help me in my difficult situation. Germany was safe before it joined America in its satanic union against so-called terrorism,” she said. An unidentified voice in the background read out a statement in Arabic saying: “We extend our ultimatum to the German government 10 more days to begin the withdrawal of its troops in Afghanistan; otherwise we will kill this criminal woman and her son”. Mrs Krause, who is married to an Iraqi doctor, said she worked for the Austrian embassy in Baghdad. 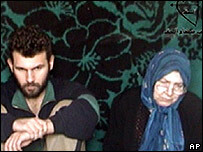 The kidnappers’ statement said her son worked for the Iraqi foreign ministry. Germany has made several appeals for the hostages’ release, including a video message from President Horst Koehler, distributed in Germany and the Arab world.